Sunflowers must be in season now. I see them in abundance where ever flowers are sold and they are a very reasonable price. Recently I brought some to use at a group-hosted party and since no one else wanted them when the party was over, I brought them home with me. The sunflowers ended up in a variety of vases that I have picked up here and there over time. out life as a pretty beverage bottle. Sunflowers are interesting from every angle. were being discontinued and had been marked down to $5 each, I decided to add them to the mix. The company that made them called them "Craft Glass". I really don't know what "Craft Glass " is even after reading the label. The packaging actually kind of hides the nice features that the bottle/vase has. 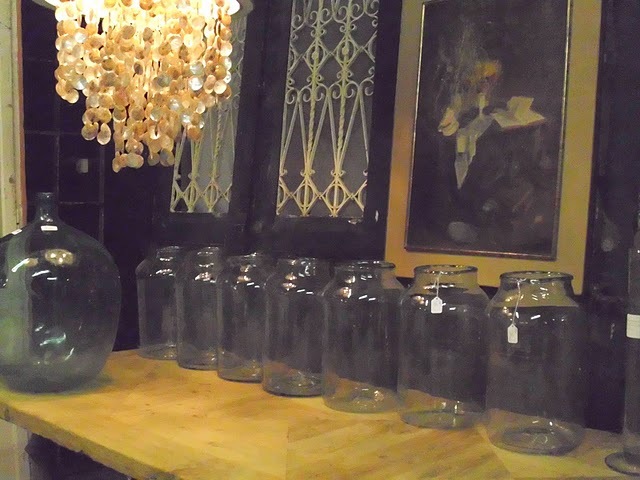 They reminded me of the photo of French pickling jars that Sherry at "No Minimalist Here" had shared with us recently that she had seen at an antique mall in Destin. The new vases have wavy glass that is reminiscent of an antique. Their mouths are smaller than the real antique jars but that will work in their favor as they hold up future sunflowers. Some other flowers that came home with me after the party were the daisies. Their stems had been cut pretty short so they went in small vases and jars. They nestled in with the votive candles and the greenery in glass that I already had on the kitchen table. Every photo in this post was lovely and made me want to go shopping! Oh I so love sunflowers, I think they are such a happy flower and using the multiple vases is such a great idea. It looks gorgeous. I also like all the daisy's in with the greenery in multiple vases. Everything looks so much more impressive and interesting in multiples and this is really pretty. Hi Gayle, I bought one of these vases from JoAnn's last week too! I would have got more but that was the last one. Sure beats the $125 each for the pickle jars! I have always loved sunflowers and yours look wonderful in the glass vases. Thanks for the mention. oooo...I do love the daisies the best...so beautiful! I must admit I like a good sunflower backside though - they really are beautiful, aren't they? Oh, I love the sunflowers and daisies in all the various bottles, jars, and vases! check out my FB and twitter too! Love your sunflowers-this area does not quite have them ready to market yet. A few more weeks. We are always behind it seems. wow..what a beautiful collection you have...loved all pictures. Love all those pretty sunflowers and lots of sweet little jars, well rather large jars! Love your daisy display too. Oh how I love sunflowers....nothing says summer more. We have fields and fields of them out here...at least up until a couple of weeks ago. They were just gorgeous. I never heard of craft glass before but really like the look of the glass bottles. 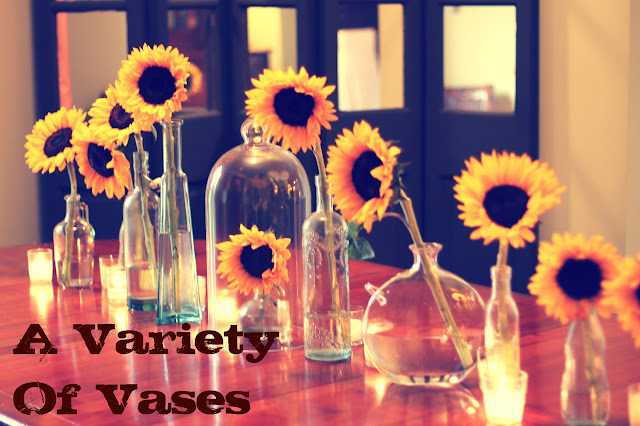 The sunflowers and daisies look lovely in all of the different vases. Lovely! You have created your own field of sunflowers right there on your table to enjoy rain or shine. I love grouping flowers together. My dad grows sunflowers and one has yet to open and it is over 10 feet now. It just keep stretching to the sky! I love your display of sunflowers, they are lovely. Found you through Barb and Dells blog. You have a lovely blog here and I will be back.